Coconut and rosewater cake! This cake is made from the scratch and filled with the bold flavour of coconut, topped it off with glaze icing to give it a beautiful appearance. This kind of cake can make everyone spell Wow as it tastes so good and look so gorgeous then no one can stop themselves from having a bite of it. The delicate fragrance flavours of rose water combined with a lovely moist baked cake will definitely increase the curiosity level of your dear ones. This cake could be the best family desserts as it is easy to make and looks beautiful. It gives you the taste of the tropical as this classic delight uses fresh coconut and a secret ingredient of rose water to give it a light fragrance flavour. You can bake this cake at home by following the instructions step by step. If in case, you can’t bake this cake because of some significant reasons and still want to try the tasting of it, then you can order the cake online or offline as per your wish. If there is any reason for the celebration, then amaze your dear ones with the delectable flavours of this cake. Also, this can be the perfect cake for valentine’s day to celebrate the day. Go for it! 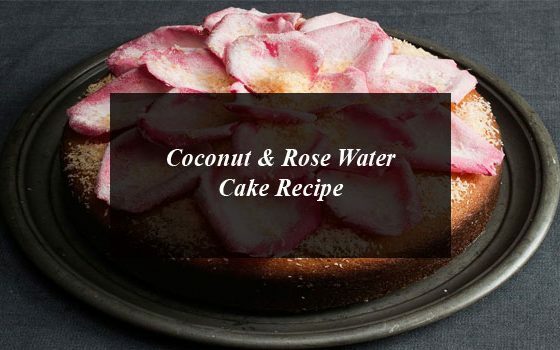 Try this coconut and rosewater cake recipe and enjoy its irresistible flavours. Preheat the oven to 170C. Greased the 3 round cake tins with butter and sprinkle the flour carefully and liberally. Shake the baking tins well to remove the excess flour from the tin. Take a bowl and beat the ingredients, butter and sugar well until it becomes fluffy. Add four eggs (one at a time) and beat the mixture until it gets fully combined. Then, add vanilla bean paste and a half teaspoon of rosewater. Combine all the ingredients well. Take another bowl and sieve the flour mixed with a pinch of salt, ¾ tsp of baking powder and coconut (desiccated). Pour one-third of the dry mix into the wet mixture of butter and eggs (step 2). Beat the mix. Add 200ml milk and remaining dry mixture into it and beat it well again. Beating mixtures properly will give you an even texture. Pour it into greased round baking cake tins (step 1). Spread the batter in the tins evenly and bake it for one hour or until the toothpick inserted in it comes out clean. You can also press the cake gently if it springs then your cake is ready. Don’t remove the cake from the wire racks until it gets cooled. Next step is to make the syrup. Add water, sugar and rosewater to a pan and gently heat until the sugar dissolves. Bring it to boil and simmer without a lid for 4 to 5 minutes until it becomes sticky. Don’t remove the cake from tins. Pour the sticky syrup and give the cake enough time to absorb it. Turn out the cake onto a plate very carefully when the tin is completely cooled. Now, its time to decorate the cake. Sift the icing sugar and add one tsp warm water, a drop of rosewater and food colouring into a bowl. Mix it well until it becomes thick enough to coat the back of a spoon well (you can also adjust the consistency by adding water and icing sugar). Spread the mix onto a cake and enjoy this super delicious cake with your friends or family. 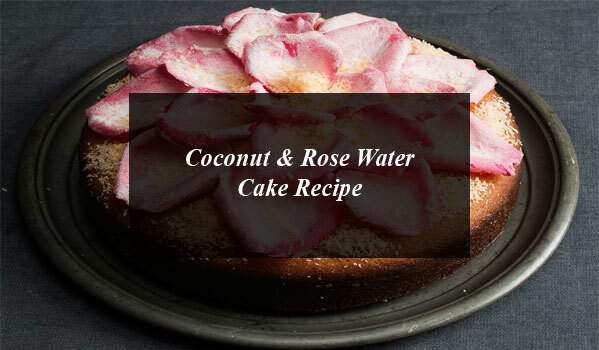 What would be better delight other than this coconut and rosewater cake? The recipe is easy and fun to make. Share the delectable flavours of the cake with your dear ones staying in another city with the cake delivery in bangalore or any place where you wish to be. If you don’t have much time to bake the cake then you can order the cake online from any famous online portal like Winni.in also. Stun your family and friend with this fantastic delight. We hope that this recipe will help you with baking your delicious cake.